I have a confession to make: possibly the biggest single reason for me to finally pick up Dragon Age 2 was the chance to play Mark of the Assassin. This was the final DLC released for the game, and in addition to providing a great, complete adventure, it also serves as a bit of a showcase for Felicia Day. I really enjoy Felicia's work, including her creation of The Guild and all the great stuff she does at Geek & Sundry, so I was eager to see her efforts in yet another medium. In Mark of the Assassin, she plays Tallis, who may be the best DLC NPC I've yet encountered. Yes, she's another dual-wielding female rogue, bringing my party total up to 3, but she has a very different personality from Isabella, and interesting combat mechanics as well. 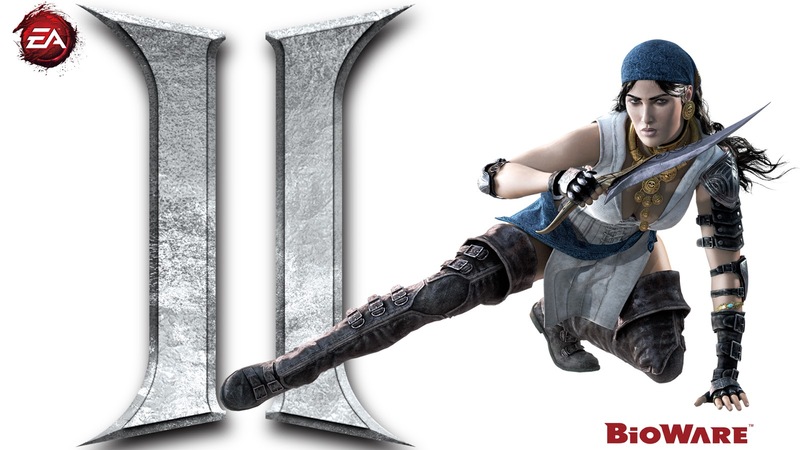 She has unique daggers (similar to Varric's Bianca) that she can actually throw at range, allowing her to be a mid-range DPS character, distinct from the short-range melee and long-range bows I'm used to. Her personal ability tree has skills borrowed from the Assassin tree, appropriately enough, and she also has access to all the standard Rogue abilities. If you don't read anything else in the post before playing the expansion, read this: bring a Maker's Sigh with you! Her initial skill allocations are absolutely horrible; in my game, at around level 24, she had absolutely no Willpower, making her practically useless in fights. With a Maker's Sigh, though, you can rebuild her any way you like. I brought along Aveline and Isabella, and was actually able to get a party that made some sense despite having three dual-wielding rogues. Selene had already mostly focused on Dual Weapon and Assassin, while Isabella focused on Dual Weapon and Subterfuge. I gave Tallis base abilities from several trees, but mostly built out her personal tree ("Infiltrator"), then focused on Sabotage with some points in Scoundrel as well. So, in most fights, Tallis took care of crowd control, Aveline handled tanking for powerful enemies, while Selene and Isabella dealt the most damage. In some fights, though, Tallis was very valuable as a semi-ranged DPS fighter, so she brings a lot of flexibility to strategy. I liked combat in Mark of the Assassin much more than I did in DA2, or even Legacy. I think that by this point Bioware had gotten the memo that gamers were unhappy with dematerializing waves of enemies, and I don't believe that there are any to be found here. This doesn't mean, though, that enemies just stand around waiting to be attacked, like they did in Origins. When fighting Ghast, for instance, they leap out of burrows, chattering menacingly. They tend to do this one at a time, which is both good (you can sometimes kill the first one before the second is ready to fight), and bad (threat management becomes very challenging when new opponents are steadily trickling onto the battlefield!). In other fights, enemies will reinforce, running in through doors or the like. And in still more fights, you're progressively drawn farther in, forced to chase a string of opponents, similar to several of the encounters in Awakening. Anyways. I found the fights to be much more tactical and satisfying than others up to this point. Some of the fights are very difficult, but most of those are also optional. I doubt that many people will choose to skip them, though... I love combat that requires careful thinking and strategy. What I liked most about MotA (besides Tallis) was all the stuff that wasn't combat, though. I'll get into this more below, but unlike most other DA games, you spend a substantial amount of time doing things besides talking and fighting. It gave me a fresh appreciation for what the engine is capable of when designers put their minds to doing something new. The rewards from MotA felt a little weak... it was definitely "worth" doing, but I came out of it with very little gear that I plan on keeping. There is a new armor set that stat-wise seems to be the best I've found yet, but (at least on my female rogue) I don't really like the way it looks. There are several accessories that are pretty powerful, but unfortunately, the best ones are bound to Hawke, and my Hawke already has other equipment that works better for her. You do get a good amount of coin in the game, albeit less than Legacy provided. Oh: one thing that's very cool, though, is that your companions each get personal side-quests in the game, and completing them will reveal some more story about each, and also provide them with a good personal item. Again, I would have liked something more powerful, but I'll probably end up equipping them, if just for the flavor. Finally, there isn't a ton of XP to be gained here... again, I think I just gained a single level over the course of the expansion. Time-wise, MotA lasted longer for me than Legacy did. I didn't keep track of my hours, but it probably clocked in a bit under ten. Subsequent play-throughs will undoubtedly be quicker: I spent a lot of time on some of the puzzles, and was too obsessive about taking screenshots, frequently pausing the game and manipulating the camera. It's hard to resist, though: it just looks so gorgeous! There are phenomenal vistas: gorgeous green mountains, lush forests, idyllic mountain lakes. There's also pretty stunning architecture, along with the requisite caverns and dungeons. I've had a hard time not bursting out with this already, but: it's a heist! It's a heist! It's a heist! IT'S A HEIST!!! Boy oh boy, do I ever love a good heist! Heist movies, heist games, heist episodes... I can think of few purer forms of entertainment than a good heist, whether it's Firefly's Ariel or The Castle of Cagliostro or reading The Great Train Robbery. MotA hits all the important beats: assembling the team (albeit in abbreviated format - would have loved scenes of you convincing your companions to join you, but I'm sure that was too much to ask), planning the job (done with an entertaining voiceover by Day against the cool Dragon Age animated backdrop), meeting with your mark, scoping the area, infiltration, seducing guards, the trap, the reveal, the escape... it's all there and all good. It's not everything, though. While it starts off as a heist, it moves in some interesting directions. Which is fun! As I noted above, the expansion does much more than just add new characters and new battles (though both of those things were great). It also adds some entirely new game elements. The most significant of these is a stealth portion, which felt a bit like an answered prayer, since I'd just finished bemoaning how stealth no longer was a viable solution in DA2. As far as I can tell, you can choose whether to sneak or to fight your way through this segment; but really, if you had the chance to be stealthy, why wouldn't you take it? The stealth mechanics are decent, if not amazing; this isn't like playing Thief: The Dark Project or Metal Gear. Still, a little bit goes a long way. The best element is having guards (some stationary, some patrolling) with true line-of-sight implemented. I was delighted to see that there are multiple ways to deal with them: you can throw a small stone to cause a distraction, or sneak up behind them and knock them out, or simply creep along and try to stay out of their vision. Multiple solutions to a single problem is one of my favorite aspects of any RPG. You also have access to shadows; I would have liked to see more of this mechanic, but the developers were probably limited in how much they could do. Puzzles also form a significant part of MotA's playtime. Yes, I know we've had puzzles before, but nothing quite like this. They take different forms: sometimes you need to observe your environment to discern a solution; other times you need to plot a path through a variable maze; and there's one particularly fiendish tile-flipping puzzle that ate up far more time than I care to admit. The puzzles feel somewhat reminiscent of those in Golems of Amgarrak or the Stone Prisoner, but are unique and more challenging (at least for me) than those earlier works. Oh, and let's not forget the characters! I've been skipping over them since I'm so excited about the new game elements, but I got a lot of pleasure out of everyone you can meet. I mean, one of the first things you get to do is attend a dinner party! A dinner party! How cool is that? I have odd tastes in my RPGs: I love dealing with politics and schmoozing. The guest list is particularly impressive, and brings together several folks from both Origins and DA2. There's Bann Teagan, impressive as ever, gently supporting the irritable Arlessa. Lady Elegant and the Comtess de Launcet hold court. My breath vanished when I moused over a far figure and her name popped up: Leliana. My love! It was slightly jarring to speak with her; I have grown very used to the version from Dragon Age Redesigned, so this seemed like a different person. The voice was still as sweet as always, though, and it was wonderful to encounter her again. Our chat was civil and far too short. It seems as though Tallis has met her before, and given their similar pasts, I suspect they may have been rivals or partners or lovers or some combination thereof. I like to think that this was all before Leliana met Kiriyon, though. I'd alluded to this before, but there's a ton of content for your companions: maybe fewer banters than in Legacy, but a lot of participation in cut-scenes, plus personal quests and items and such. I was so happy that I brought along Isabella and Aveline: those two's relationship is probably my favorite in the entire game, and they were in excellent form here. There are some terrific lines, too... at one point, Selene brought up the possibility of Tallis joining the team. Tallis said she wasn't sure whether she would fit in, at which point Isabella said something like, "Let's see. Are you possessed? Consorting with demons? A pathological liar?" Aveline complained that she isn't any of those, so Isabella amended the list: "Can you run five miles while carrying a cow?" Anyways. I don't see myself replaying DA2, but I do think I'll likely replay MotA with different companions so I can do all their personal quests and hear more great dialog. The reveal that Tallis was a follower of the Qun was a bit surprising. Not unprecedented, though.. the events near the end of Act 2 make it very clear that the Qunari are followers of a religion, and not its predominant race. (It also seemed like a potential ret-con for why Sten looked the way he did in DA:O. He was a 'Qunari', just not one of the horned ones we generally see now.) There's also some interesting symmetry between the Ben-Hassrath and the Seekers: both are powerful, secretive, independent organizations within a larger religion that have a fair amount of autonomy while working to enforce orthodoxy. I can imagine this stuff becoming a very significant part of Dragon Age 3, what with the game subtitle and setting in Orlais and everything. It also makes for some more interesting comparisons between Tallis and Leliana. We don't know much about Tallis's past (at least I don't - I still need to see Redemption sometime), but it seems like Leliana started as an assassin and later found faith, while Tallis found faith and decided to fulfill it by becoming an assassin. Both are fully devoted to their religion, and also extremely critical of those within it who are doing wrong. I couldn't completely reconcile Tallis's innate goodness (her desire to preserve life, to prevent the suffering of innocents) with her devotion to the Qun. The Qun certainly isn't an evil philosophy, but Tallis was the first person I've met who seems to think that the Qun is compatible with virtues like compassion. I thought that the Qun was all about certainty, and order, and obedience to a higher purpose. I don't see Qunari regretting actions that they've taken. But, to be fair, Tallis is very different from the Qunari I've seen before. In many different ways. Some notes on combat: the hardest fight for me was actually fairly early on, when you need to / can fight the Sky Horror. Having an all-melee party did not help matters. I eventually found success by saving Selene's cooldowns on Mark of Death, Assassinate, and Twin Fangs. Any time that the Horror rejoined the field, she and Tallis would immediately drop what they were doing and use their highest-powered attacks on him. If we were lucky, we could drive him back behind the barrier before he fired off his ultra-deadly AOE attack. If we were unlucky, we died and I reloaded. In between, we would just fight the summons; I made use of short cooldowns like Backstab and ongoing attacks like Pinpoint Strikes, but generally took my time here. My party died a LOT. I had optimized the group for fun and personality, not for combat effectiveness. (I initially brought Merrill with Aveline, but felt weird flirting with Tallis while she was there. Merrill did seem surprisingly blase about the situation, though... after complimenting Tallis after her initial appearance, Merrill said, "Yes, she is very pretty, isn't she?") It got to the point where I didn't even bother using injury kits on Isabella or Tallis, since odds were pretty good they would die soon regardless. It was still good fun, though. Many fights ended with Aveline and Selene dual-teaming the last boss, and a couple finished with Aveline beating down the remaining enemies into a bloody pulp, which takes FOREVER but is weirdly satisfying. The highlight, though, is undoubtedly the final battle against the Duke's forces, which was one of the more insane and entertaining things I've seen. I mean, any one of those elements would have been terrific, but having a gun AND riding around on the back of a wyvern?! Crazy! I loved it. As usual, the lore was one of my favorite parts of the expansion. I enjoyed getting some more glimpses into Orlesian society (particularly the outrageous accents and manners), a fresh perspective on the Qun, looks at some new creatures, and what felt like some foreshadowing about a struggle between the Orlesian Empire and the Qunari. The final scene with Tallis was sweet as well. Tallis has a friendship/rivalry meter, but nothing you do seems to ever generate any points on either side. She keeps track of what you say to her, though, and this affects her later dialog. In my game, Selene was very affectionate towards Tallis, flirting whenever possible and supporting her through the discussions about the Qun. Tallis leaves at the end no matter what (I'm guessing it would be prohibitively expensive to add dialog for her into the main game), but she did give a kiss. In terms of value, I'd say Mark of the Assassin is absolutely worth the ten bucks. Game-wise, it's the most interesting and varied installment yet of DA2. Felicia Day is fantastic as the voice and model of Tallis, and there's a wealth of new content for your companions and other old friends from Thedas. I think MotA will probably have particularly high replay value, thanks to all the attention given to companions. Like Legacy, it can be played at any time throughout the game. Story-wise, it's probably best played late in Act 3, by which point you will have met more of the NPCs who appear and can unlock some fresh dialog. Game-wise, it might actually be better in an earlier act; the gear it provides at endgame is nice, but not noticeably better than what you get from Legacy. And now: surprise! A meditation on DLC! DLC seems to be a very political issue in the gaming community. Words like "greed" get thrown around a lot. It seems to be here to stay, but it also is evolving and changing over time. We've gone from full-on expansions to one-shots like Horse Armor to various mission packs and expansions and such. Nobody enjoys spending money, and I think consumers are particularly sensitive to feeling like they're being tapped again for previous purchases. People generally seem happy when they purchase an item like a new TV or laptop, and generally irritated paying for ongoing subscriptions like cable or Internet service. Back in my early days of gaming, I never regretted paying for an expansion to a PC game that came in its own separate box: Civilization II: Scenarios, Civ 2: Fantastic Worlds, Ultima VII: The Forge of Virtue, Baldur's Gate: Tales of the Sword Coast. Functionally, these were practically identical to today's DLC. They require you to already own the base game, they cost less than a new game, and they add some new features; interestingly, all of those examples also allow you to play content throughout the course of the main game, instead of requiring you to first beat it and then add some extra stuff after the end. Somehow, though, when physical expansions morphed into digitally downloaded content, something about the experience changed. Part of it may be because it feels less substantial: we're paying real money, but don't get a nice box with pretty art on the front to put on our bookshelf. More of it, though, may have to do with the pace with which DLC is released. The most egregious example is the infamous "Day 1 DLC", where functionality is actually built into the game, and you must pay a fee to "unlock" it. This leads to some metaphor shear on the part of the consumer, who thought that they had bought the game, only to learn that they can't actually use all the bytes they purchased. Now, I've heard that this phenomenon is actually not rapacious; the lead-time to bring a "finished" game to market is substantial, and thus enough time can elapse between having a gold-master-ready candidate built and actually selling the game in stores to allow the company to finish work on additional characters and quests. That isn't the perception, though. I think game companies could avoid a great deal of ire if they simply delayed all expansions for a decent interval after a new game arrived. This leads to another issue, though, which I'm currently confronting in my Mass Effect experience. ME is one of my favorite series of all time, and I was very satisfied with how well it ended (with the Expanded Cut). However, because it has ended, all DLC that Bioware has released is necessarily positioned earlier in the third game; unlike Tales of the Sword Coast or Lair of the Shadow Broker, you can't choose between playing it in-line with a future game or after the end of your previous game. For a narrative person like me, that makes this sort of DLC very unsatisfying. I feel like I have an authoritative, canonical version of Shepard who has saved the galaxy, and... I dunno, it just feels weird to rewind that and start inserting different things into her story. I think that a lot of fans handle these sorts of dilemmas by just re-playing the game. Frankly, though, I doubt that I will ever replay ME. I love all my memories from the game, but don't think I'd be able to stand driving the Mako, sorting through dozens of useless weapons, and scanning planets all over again. It's possible that I might try another game one day as an Adept or another drastically different class, but it's far more likely that I'll spend my limited gaming time on new entertainment, or older games with highly varied PCs and stories (Baldur's Gate trilogy, DA: Origins). So it is with DA2. I'm really happy that I bought it as late as I did, since I found Legacy and MotA to be even more fun minute-by-minute than the main game, and I could enjoy them within the context of Selene's rise to power. If I had bought DA2 new and finished it before the expansions arrived, I doubt that I would have ever bothered to go back and play them. This is a distressing thought for several reasons: I might not have given Bioware money to support them, and I would have missed out on some really fun gaming and lore. What does this mean for me going forward? I'm not sure! I've really enjoyed Bioware and their games and want to continue showing my support by buying new games and snapping up enticing DLC. However, experiences like ME3 and DA2 make me feel like I'll be much happier waiting until the inevitable Ultimate Edition arrives, which will allow me to make a canonical run through the complete story. To be totally clear: I think that DLC has value. A lot of effort goes into writing new stories, creating new creature models, building new environments, scoring new music, designing new battles, and all that good stuff. I'm glad that companies continue to add more things to games that I love, and I think they deserve to be paid for it. I'm just not sure what the right model is to use for designing and distributing it so every customer can get the most from it. I'll need to make this decision soon with Mass Effect: Citadel. Playing Omega was already a bit of a weird experience. I'm excited by everything I've read about Citadel... and it makes me regret playing ME3 so early instead of waiting for it to come out, so I could have had those experiences with my Shepard. Will I revisit this? And would there be any point in finishing the game yet again afterwards, or do I just splice that story into my existing tale? And, though it pains me to admit it, this also makes me more hesitant on Dragon Age 3. I'm actually quite optimistic about the game, based on everything I've read and heard from the developers so far. But will I maximize my happiness by grabbing the game immediately? Or will I need to wait another year or two for it to reach a more complete form? Well, that was longer and less productive than I had thought. Sorry about that. Final note: as usual, I went ahead and tossed together a whole slew of screenshots. And I do mean a SLEW. I ended up with a round 600 (!) screenshots for this EXPANSION. Careful editing and trimming brought me down to a svelte 409. As always, spoilers fill every nook and cranny of this album. Okay: this will probably be a little complicated. I'm trying to figure out the best way to structure my remaining posts on DA2. I'm wrapping up an exhaustive play-through of the main campaign (sans the Exiled Prince), which includes two purchased DLCs, Legacy and Mark of the Assassin. Chronologically, I played through the expansions late in Act 3, so near the end of the game but before I actually beat it. I think I'll do one post apiece for each DLC, then one mega wrap-up post for DA2 that covers my final thoughts on the game, both mechanical and philosophical. Deal? So, here goes: first, the question of when to play. From what I understand, the content is leveled, so you can tackle it at any time. However, the rewards are leveled as well. They will be a bit better than what you would ordinarily get at that time in the main game. So, for example, if you play during Act 1, the gear you get will be better than what you would ordinarily find in Act 1, but will eventually be replaced in Act 2. By doing it near the end of Act 3, the gear I got ended up being the best in the game (at least, until I play Mark of the Assassin). Also, story-wise, the content of the expansion will acknowledge what has already happened in the main game. I think that you'll probably get the most content if you have already played through the majority of the game, but you should get different stuff at any stage. You can pick any companions you want to bring along. I recommend choosing an effective team. Most of DA2 is, frankly, pretty easy; you can beat most battles with any random collection of people. Legacy is actually pretty challenging, though. Fortunately, there was one part a little ways into the expansion where I could swap out party members, so I switched from "Here's a fun group of people!" to "Here's a fun group of people who won't die!" The battles are much more tactical in Legacy than in vanilla DA2, and you'll finally have use for some abilities that were only rarely useful before. For example, you'll occasionally encounter a group of enemies who are lined up in a row, which is a perfect opportunity for something like Archer's Lance. There are also more environmental features, like traps that you can activate to attack your enemies (or that can be activated to harm you), and complex battlefields that require you to make decisions, such as whether to take a detour to take out some weak snipers or endure their fire while tackling melee opponents. The expansion also starts to address one of my two least-favorite aspects of DA2: the replicated environments. All the settings in Legacy are different from the DA2 maps. These cover a great amount of ground, quite literally: a vast desert area in the Free Marches, a surface dwarven fortress, a sprawling dungeon, a vast underground cavern, a green lake with a giant tower. Now, a couple of the maps are internally recycled - you have a set of consecutive boss fights that all seem to be set in the same chamber - but it didn't happen often enough for me to get irritated. The actual textures seem to be a mix of new and old, with a fair amount of new stuff. The expansion makes some interesting and largely cool changes to the look of Dragon Age. The most obvious comes a little ways in when you encounter the Darkspawn. These seem to have been totally redesigned; in particular, the genlocks are a LOT bigger and scarier-looking than in the previous games. Genlocks used to just be fodder, little ugly dudes who ran around and stabbed you. Now, they are enormous rotund brutes. The Genlock Alpha now seems a bit like a troll, but it has a huge shield that it wields to devastating effect, including one move that I dub the "choo-choo train". A few new NPCs make an appearance in the expansion, and I was really impressed with their design and voicing. One particularly sad/funny character seems to be a mixture between Igor and Gollum. 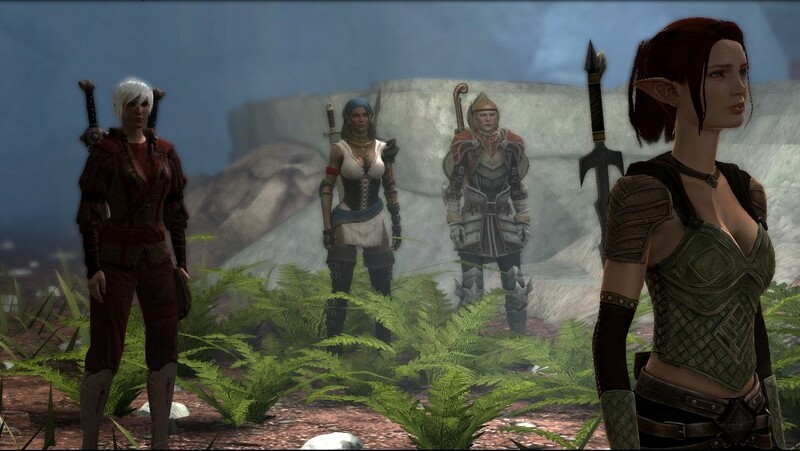 For my team: I'll go into more details on my team composition / combat strategy in my upcoming DA2 post, but for now, I'll note that I initially arrived with Hawke (a dual-wielding rogue), Merrill, Aveline, and Isabella. You'll note that, apart from Merrill, there's no AOE in that group, and it led to a lot of suffering. Isabella would typically die a short time into almost every major fight, and sometimes Hawke or Merrill would die before the end. Later, I was able to swap in Varric for Isabella, which helped a lot... he's still a bit squishy and would sometimes die (which he never does in the main campaign), but if I kept an eye on him I could keep him alive, and in any case he was able to take down a lot of bad guys. Varric was also a great person to have along for lore reasons, and I would recommend taking him even if he isn't normally in your party, just because of some insights he has and makes on the dwarven situation. In contrast, Aveline and Merrill were fun to have along, and had some good banters along the way. Similarly, there was another interesting fight against a couple of golems. Each golem has a special property: one is very heavily armored and resistant to physical damage; another is immune to magical attacks; and one constantly regenerates health. They activate, one at a time, and after taking enough damage they will shut down and activate another. Towards the end, multiples can be active simultaneously. Tactically, this was a relatively straightforward battle - what you need to do is visible right in the name of each golem - but it was still an interesting system for combat and a fun fight. The rewards for the expansion are pretty decent. There was less XP involved than I expected; I think I only gained about 1.5 levels for the whole thing. It would probably be more substantial at earlier levels, though. There are some loose potions lying around, which can take you above the 12 or so that the game normally spawns for you; I think I had about 20-25 by the end. The coin is pretty excellent: it was kind of a let-down in DA2 when you would find a gleaming golden pile of treasure, then click on it to find that it contained 56 pieces of silver. Many of the loot piles in Legacy have actual gold coins; I think I earned close to 100 gold by the end just in currency, plus a bunch more from selling trash and items. The items are fairly good... there's a nice set of armor for Hawke, a semi-random assortment of rings and belts and amulets (including two very useful Bone Rings for Merrill's blood magic), and a couple of unique items for companions - I found a nice ring that only Varric could wear. Oh, and there's also a unique weapon and belt for Hawke. Both are good and worth equipping, though not amazing; I suspect I'll replace them in Mark of the Assassin. I'm also trying to decide whether to keep my new armor set or not... it has better stats than my Champion set of gear, but looks kind of goofy, sort of like what Captain America would wear if he was a medieval female rogue. If I had to make a complaint - which I don't, but I will - it's that I feel like we've played this expansion before, back when it was called Watcher's Keep. Once again, we have an Ancient Evil, who has been Sealed in a Tall Tower, by the Sacrifice of a Guardian, who belongs to an Order responsible to Imprison the Ancient Evil, and who Manipulate the Hero while Avoiding their Duties. It's not a bad story, to be sure, and elements like Larius keep it feeling fresh. The lore was really cool. We haven't heard much about the Grey Wardens in DA2, and this shed some fresh light on them. The Wardens have a close relationship to the dwarves, since they're the two groups who constantly fight darkspawn. As far as I can tell, though, none of the dwarves were aware of the prison the Wardens built, or else they wouldn't have stumbled inside there. We've seen glimpses before in stories like Warden's Keep of how the Wardens can be insular, secretive, and manipulative; they built the prison for good reason, but have caused suffering to others through their actions. I was also fascinated by Larius. We've heard about the corruption and the Calling since early in Origins, but I'm pretty sure that this is the first time we've seen a Warden in this condition. While his gait and speech are funny, his condition is quite sad. I've always thought that the Calling was very melancholic, and have been intrigued by any writings about, for example, Called Wardens fighting alongside the Legion of the Dead in the deep roads. That said... I must confess that I sided with Janeka against Larius. I have no good excuse for this. Everything about the situation was screaming out that Larius was right (in the immortal words of Robert Anton Wilson, "Of course I'm crazy, but that doesn't mean I'm wrong"), that Corypheus was too great a danger to release, that he couldn't be bound, that he was manipulating the Wardens in the same way he had manipulated the Carta and darkspawn. I guess it ultimately came down to Merrill and Varric weighing in on Janeka's side. I should have known that sensible Aveline would have it right. Once I figured out just who and what Corypheus was, my jaw dropped. I had thought that he was some sort of older awakened darkspawn, like the Architect from Awakening. Nope: he was one of the ancient Tevinter magisters. One of those who pierced the Veil and pursued the Golden City! The one who caused the city to turn black! The one who brought demons into the world! The one who freaking created darkspawn and the blights! The one who unleashed almost all the suffering that the world has undergone for thousands of years! Right here! I had plenty of time to mull over this celebrity and its infamy while conducting the final boss fight. I'll comment more on this phenomenon in my upcoming DA2 post, but while DA2's combat is generally stupid, its level-ending boss fights are awesome: they're much more interesting and tactical than any of Origins' fights. I generally have to suffer and die a couple of times before figuring it out; once I have the system down, I can make progress, but still need to keep on my toes. In his normal aspect Corypheus is quite easy. He doesn't hit particularly hard, and doesn't seem to have much resistance or immunity. Hawke tends to be my main damage-dealer, and she could often beat one of these stages with a single rotation of her singular talents: Mark of Death, Backstab, Assassinate, Twin Strikes. The tricky part comes in between those aspects. Corypheus teleports to the middle of the room, becomes invulnerable, and starts channeling power from one of the statues. I had initially thought that this was to regenerate his health, as with the Queen of the Blackmarsh from Awakening. Actually, though, he activates an awful fire-spinning mode. If you imagine the room as being a clock, then the fire is like a set of hands that constantly sweep the face of the clock, slowly rotating in unison. Your party will take massive fire damage whenever it hits you. During my first attempt, I quickly noticed that the four statues had become actionable, and deduced that I would need to use them in order to continue fighting Corypheus. So I split up my team, and had each person run to a separate quadrant, and activated the statues nearly simultaneously. This ended... poorly. Each statue spawns two Lieutenant-level shades; nothing too difficult, but when facing a single companion who is probably taking massive fire damage, it proved extremely painful. Varric died almost instantly. The others were able to fight off their opponents, then run across the room and slay Varric's killers, upon which Corypheus transported himself back into the arena for another quick bout. I revived Varric with a consumable item, only to have him die again the next time Corypheus summoned fire. After one or two wipes, I came up with a new strategy. I should have learned this long ago from horror movies: when facing an ancient unspeakable evil creature, never split up! Instead, I kept all my guys together and ran to a single statue when Corypheus started drawing in energy. His spokes of fire start off at the statue he's draining and the one opposite; I think it was north and south in my game. So, I huddled by the west statue. As soon as the flames appeared, the statue became clickable. I selected it, then quickly killed the two shades before the fire completed its one-quarter rotation to us. Again, Hawke's skills worked great here; Assassinate can one-shot a statue guardian, even without Mark of Death, and Twin Strikes will take off a majority of the others' health. In retrospect, I did kind of love how the battle design puts a time limit on combat, which adds some meaningful intensity and makes it a good strategy to pop high-damage, high-cooldown abilities early. (In an earlier attempt, I tried to engage the enemies while simultaneously fleeing the flames, which was less successful.) As soon as the second guardian shade fell, I would immediately sprint out ahead of the onrushing flames. We would run forward until we had caught up to the far spoke, then follow it until we reached another statue, at which time we would activate it and repeat. The section after this gets nasty, though. After another fairly simple bout against Corypheus (who does teleport once mid-combat, but is otherwise unremarkable), he then blasts down large sections of the stone roof upon you. Now, in addition to the spinning wheel of doom, you also need to navigate a twisted warren of rock obstacles. This, of course, makes it even harder to stay ahead of the flames. This was the last time I died in the fight... well, actually, I think I reloaded after Varric bit it. I blame the pathfinding: it's usually quite decent, but during this section, there would often be times when a person in the party would head off in entirely the wrong direction, towards the flame and with no opening back to our destination. I guess that in a normal fight I wouldn't even notice: the companion would correct and head back after a few seconds. The stakes are too high here, though! I learned the hard way that I need to keep a close eye on everyone, pausing a fraction of a second after issuing move orders, and immediately selecting and re-ordering anyone headed the wrong way. After getting this down, I was able to beat Corypheus on my next try. There's a third and final stage to the Wheel of Doom which is even harder and crazier. Basically, he has summoned all the elements against you: spokes of fire, inconvenient boulders, electricity that runs along the rocks and creates live currents between them (dealing minor electricity damage whenever you cross a threshold) AND giant icicles falling from the ceiling, that damage and (gulp) slow you down. While I needed to pay constant attention to what was going on, I finished the final fight without any close calls. One nice side-effect of the constant running is that you have the opportunity to naturally regain health and stamina. I think Hawke maybe drank one or two stamina draughts, and perhaps a single health potion, but that was it. Shortly before finishing the third and final wheel, Merrill temporarily deactivated Blood Magic and drank a potion, but even then she was still at half health, and could have done fine without it. Aveline was surprisingly resilient, and even Varric never fell. The lesson I've learned is one that all RPG players know by heart: stay out of the fire! The final, final round against Corypheus was a blast. He teleported once or twice again, and this time it was a bit more challenging to re-orient to him, what with all the fallen rocks and plunging icicles and everything. I pulled out all the stops with Hawke, and even managed to finish him off in style with an Explosive Strike. The post-battle finale and coda were done very well. Janeka was nicely humbled and thankful. Am I just imagining things, or is there a possibility that Corypheus may have escaped with her? Eh, I'm probably making it up. Well. She's an interesting character, and I hope we see her again in DA3. The scene with your mother was a very kind grace note. I suspect that if you played Legacy during Act 1 or early Act 2, this same conversation would probably "really" happen. They presented it very well, though, such that it doesn't feel recycled or anachronistic. How many of us wish that we could spend some more time with loved ones who have passed on? On the whole, I quite enjoyed Legacy. It improves (though doesn't totally fix) the things I dislike about Dragon Age 2, and layers on some great story, new insights into your personal history and lore about the history of Thedas. Quantifying its value is tricky. I paid $10 for the DLC, which means I spent three dollars more on this expansion than I did on the entire DA2 game. The expansion is quite a bit shorter, of course... I didn't keep close track of my play time, but it was probably around five hours, give or take some time for reloading. Minute-to-minute, though, it's more engaging than a lot of DA2: no filler quests, no backtracking, and lots of new environments to look at. I know I said before that I wasn't going to be taking any screenshots of DA2, and I did uphold that for quite a while, but I started sliding on that promise near the end of Act 2, and ended up with a whole bunch of photos for Legacy. Be warned: if you fear spoilers, or large volumes of images depicting another persons' experiences in a video game, do not follow that link. Otherwise, expect some notes on Mark of the Assassin and a final roundup of DA2 before too much longer! number9dream is an excellent book. It's also a bit of a twofer: it's a great book by David Mitchell, and reading it often feels like reading a lost book by Haruki Murakami. That's about the best compliment I can pay any author. 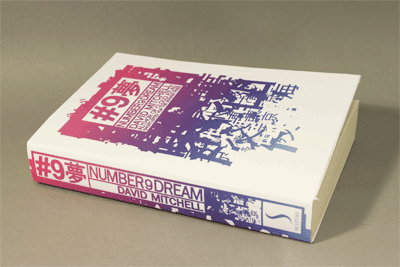 Mitchell achieves this in part through his setting, a first-person story told through the perspective of a young Japanese man newly arrived in Tokyo, but also by managing to strike many of the same notes that Murakami makes in his own book: dreamlike logic, the unusual butting up against the realist, searches for meaning that seem hopeless. He also echoes some of the grace notes that Murakami writes, including a keen appreciation for fine music (John Lennon and Claude Debussy play notable roles), the elegant shape of a woman's neck, and the delicious taste of a ripe persimmon. Even Colonel Sanders makes a cameo (beating his appearance in Kafka on the Shore by a full year.) Late in the book, the narrator is talking about John Lennon's music, and is told "#9dream is a descendant of 'Norwegian Wood.'" That sounds like an audacious statement - Norwegian Wood remains one of Murakami's best-selling novels in Japan, and arguably his most famous book, so claiming descent from it is a bold statement. It's also a slightly odd statement, as Norwegian Wood is probably the Murakami novel that this book least resembles; Norwegian Wood is a mostly-realistic and historically grounded book without the fantastical elements that define most of his other stories. I should hasten to point out that number9dream doesn't come across as a ripoff or a parody; at most it's an homage, and possibly it's coincidental. Mitchell's personal biography puts him in a unique position to write this book: as an Englishman who lived and taught in Japan for years, and married a Japanese wife, he is uniquely attuned to the minutiae of Japanese life in a way I associate with Japanese natives. I love how effortlessly he writes in this style as well: someone will address the narrator as Eiji-kun, and Eiji doesn't bother to describe to Western readers why he would visit a police box to locate a business. The book feels weirdly authentic, so much so that I wouldn't automatically associate it with the other two books of his I've read (Ghostwritten and Cloud Atlas). Incidentally, there are some really cool and very subtle links between his previous books and books not yet written. A seemingly tossed-away line says "The cloud atlas turns its pages over"; I wouldn't have thought twice about that statement if he didn't later turn it into the title of his masterpiece. And one character vocalizes a key statement of the later book, "The weak are meat, the strong eat." I love how loosely Mitchell ties together his disparate books: they aren't sequels, and don't even share similar styles, but you can follow these faint threads that bind together his moral concerns. Structurally, this book is quite different than the others I've read. Ghostwritten and Cloud Atlas were both somewhat formalist books. Ghostwritten initially seems like a collection of short stories, but one where each succeeding story shares a faint connection with its preceding story. Cloud Atlas famously works like a set of nesting Russian dolls, with each story contained within the story that follows it. number9dream is harder to categorize. It's kind of one story, and also a multiplicity of stories, and part of the joy and wonder of reading it is not being able to discern exactly where the boundaries between the stories lie. Dreams are a major theme of the book, and possibly the most important aspect. At the very start of the novel, it seems like Mitchell has written another science fiction story, like the middle portions of Cloud Atlas. More than that, it's an exciting, action-packed tale, like something from a Hollywood summer blockbuster: passwords, guns, karate, explosions, bio-borgs, Zax Omega, Zizzi Hikaru, data discs. And then, the story ends, and is retold. But things are different this time. We seemingly repeat the same scenario a half-dozen times, with drastic changes throughout. The first was filled with alarms and gunplay. The second features a massive flood that destroys Tokyo. Another takes the form of a noir detective story, and internally includes a secondary story, a surrealist horror movie. By discarding the unique elements, and only retaining the ideas that remain consistent from one version to the next, we can piece together a rough idea of what's happening. Eiji Miyake has come to Tokyo. He wishes to meet his father, a man he has never met. His only lead is Akiko Kato, his father's lawyer, who works for the law form of Osugi and Bosugi in the Panopticon building. Eiji is nervous about the meeting, and passes the time drinking coffee at the Jupiter Cafe across the street from Panopticon, and falls softly in love with one of the workers there. He doesn't learn who his father is. The book never explicitly explains all the contradictory and frankly unbelievable stories we get. I was left with the impression that we were witnessing Eiji's daydreams: I pictured him sitting in Juno, rehearsing different possible scenarios, allowing his mind to play through different conversations he might have, and indulging in some flights of fantasy. From this perspective, things like the science-fiction setting start to make sense: he sees an older man playing a video game that involves fighting bio-borgs, and so incorporates actual bio-borgs into one of his scenarios. I can kind of believe that the final story in this group, that ends with him tongue-tied and humiliated in the lobby, is probably what "actually" happened… but, given that Mitchell never explicitly endorsed or rejected any of these versions, even that realistic story carries a whiff of possibility about it. That sense of only tenuously grasping reality carried forward through the rest of the book. I kept waiting for the other shoe to drop, to learn that the stuff I had just read was a dream. Often, though, stuff won't be explicitly refuted, and after a prior event is referenced enough times later in the text, I started to uneasily accept that it might be "real" (where "real" refers to a property found within a fictional novel I am reading). The encounter with Daimon starts off as seeming plausible, then veers off into bizarre territory, finally entering a nightmarish (yet enticing) denouement. I was ready for Eiji to wake up (again) and return to his boring life in the train station… and yet, when he runs into Miriam at the park later, I was filled with doubt. Maybe it actually happened? And… if it did happen, could the encounter in the park have been a further fantasy of Eiji's? The biggest example of all, of course, is the hellish night he spends in Morino's company. This seems like a perfect example of a fabricated nightmare: he takes elements from yakuza movies that he saw at Buntaro's video rental store, combines that with elements from the dangerous night he spent with Daimon (which, by now, I am accepting as reality), and then weaves that into a twisted fantasy about how far he will go to learn what he craves. And, conveniently, by the end he still doesn't have what he wants, and nobody in the real world hears anything about the climactic events of the evening. And yet, even those events do finally seem to be true. The picture he claimed seems to be real - at the least, it plays a role in a late event of the book. Further suffering is visited upon Eiji in retaliation for the events of the night. What's going on? Is his life proving to be even weirder than his dreams? Or is Eiji living a separate dream reality, one that's impossible but is also fully realized and internally consistent? I just love that. I don't even know what to say about it. It's just perfect. Also worthy of love: the fantastic relationship between Eiji and Ai Imago. And more specifically, I just adore Eiji's tongue-tied awkwardness and the way Ai responds to it: she's frank and blunt and wry, nicely mixing together exasperation with some subtle affection. She seems to be precisely who Eiji needs, and their dialog is always wonderful to read. I'm at a loss to say exactly what the book is about. Cloud Atlas had a pretty clear and beautiful moral message that elegantly unfolded throughout the story. I get a general moral sense from this book, but it seems much more implicit. We sympathize with Eiji, and cringe in horror at the dark side of humanity displayed by Morino and Daimon and Mama-san. I don't know if Mitchell is suggesting that we emulate Eiji; despite his focused mission to find his father, he often comes across as a Murakami-style protagonist, who simply reacts to the bizarre things that occur to him. Eiji is a good person in relation to most other characters, but he doesn't seem to possess very active virtues, and certain aspects of his personality (shyness, guilt) come across as minor negatives. So, if this isn't primarily a moral story, then perhaps it is "just" a creative, inventive book. It's thoroughly enjoyable to read, and its lingering sense of unreality nicely colors every part of the story. Or maybe the book actually is "about" dreams. The beginning and and of the book seem to most directly involve dreams, while the middle section is colored by dreams. When Eiji travels near the end, he regularly falls asleep and slips into dreams, which he then relates to others or reflects on himself. They feel very believable, the kind of things you or I would dream if we had lived through Eiji's childhood: familiar people encountered in unfamiliar locations, a sense of guilt for actions you took or did not take long ago, transference between one person and another (the Ai/Anju link is very prominent in these dreams), and so on. There's another wonderful quote near the end of the book: "Dreams are shores where the ocean of spirit meets the land of matter." The more I think about that statement, the more I like it. Dreams are a kind of threshold, a place where two different universes touch: the real, the physical, the verifiable world of matter that we live in; and the supernatural, the religious, the realm of visions and prophecy and imagination and creativity. Maybe that's part of what Mitchell is getting at here... dreaming and writing fiction both involve seeing things that aren't real, and creating stories about them. The one part of the book that felt a little weak to me was the ending. It wasn't bad, but it did feel like a rather abrupt and arbitrary ending, without the graceful denouement and catharsis that Mitchell delivered in Cloud Atlas. Here again, though, Mitchell seems to be following in the admirable footsteps of great writers like Murakami, who rarely tie everything up neatly at the end. My admiration for Mitchell continues to grow with every book of his I've read. I still think that Cloud Atlas is my favorite book of his, but number9dream helps show a clear progression in his work from the already-terrific Ghostwritten. It shows that he continued to work in interesting formalist structures that give his books a postmodernist appearance, while marrying that with a deep and transcendent humanism that explores the best and worst of man. I'm looking forward to continuing to explore his books, and already dreading the day when I'll run out of new material from him. Dragon Age 2 is cruising along, and I'm now partway into Act 2. For the most part, the game has exceeded my lowered expectations. However, I am also starting to understand what many people were complaining about, particularly regarding recycled environments. I don't recall Origins having any recycled maps at all, and the original Mass Effect was probably the last game I played with that problem. DA2's environments are at least larger and prettier than ME's cave and bunker maps; however, that actually can make it even more frustrating. Honestly, I think Bioware could have almost gotten away with it if they'd just bothered to update the mini-map for each environment so inaccessible areas were just not visible. Instead, though, you see the EXACT SAME MAP for every cave you enter, every cliff area, every dungeon, etc. Depending on the specific quest, though, some doors might be permanently shut, or a boulder might be blocking off a passage... but that corridor or passage will still be visible on your map, and look like a place you SHOULD be able to go. It's just something that makes the game feel sloppy and rushed. What's weird, though, is that I don't get that sloppy and rushed impression from most of the rest of the game. The story in particular has been very engaging and polished so far. The voice acting ranges from good to excellent, the companions seem to have interesting back-stories, and there's a lot of interplay between different plot elements. Given the short production timeline of DA2, I would have thought that the story would be rushed while the technical aspects (building on DA:O's lead) would be more solid. In practice, it feels like the opposite was true. For DA3, they're moving to an entirely new engine (Frostbite), which seems like it could increase technical risks, but fortunately it looks like they're budgeting a good amount of time to get the game done right. Let's see... I'll review a couple of technical and mechanical things that have occurred to me since my last post, before jumping into the story. The interface has been almost totally overhauled, and almost all of the changes are good: they decrease the amount of time I spend in menus, so I can get back to questing. The inventory system, in particular, is much improved. I didn't have any complaints about inventory in DA:O, but in retrospect, it was a little clunky. For starters, the game gets rid of a lot of the trash items that would clog up your inventory: stuff like Frozen Lightning and Lesser Elixirs of Grounding that had some theoretical use, but that I never bothered consuming and that had very little value. In DA:O, almost every enemy would drop something, but it would usually be practically worthless. In DA2, only a few of the most powerful enemies in any battle will leave rewards. These are often cash, which is great. Occasionally you'll get a usable items, and other times you'll get an item that's automatically labeled "trash". These go into a special inventory category, and the next time you visit a merchant, you can sell all of them in a single click. The other part I love is that you can select any item in your inventory and mark it as "trash" yourself. This way, if you know that you don't want to equip a bow but will want to sell it, you don't need to look at it each time you re-open inventory. I'd previously noted the pros and cons of companion armor changes. I can now automatically mark as Trash any armor I get that requires Strength or Magic to equip. With weapons or shields, it's a little more complicated since I won't be able to compare items until I actually take the person back into my party, but since I need to carry so much less stuff, it isn't a hardship. And since, for example, I only have one companion who wields two-handed weapons, I just need to keep at most one two-handed weapon in my non-junk inventory. Also helping matters is a nice, simple star-based system that shows how effective/special any particular piece of equipment is. When I'm in doubt as to which of two pieces to equip, I can just scan their ratings and see what comes out higher. I could do something kind of similar in Origins by looking at the value of a piece of equipment, but that was hidden in another screen. Two things are a little annoying: you can't see the star rating of an equipped item, so you need to take it off when comparing to an upgrades; and each star rating is unique to the individual, so (for example) my Rogue sees all two-handed swords and mage staves as 0-star ratings. Even those are just minor nits, though. Re-equipping after a major quest used to be a long, time-consuming process where I would flip through my eight companions in camp and decide what to equip, what to hand-me-down, what to keep in the inventory, what to store in my chest, and what to sell to Bodahn. Now, I handle almost all my equipping while on the run, and just give companions upgrades when they re-join my party. I generally like how maps and travel are handled. I'm starting to wish there were a wider variety of locations, but it is nice to be able to move so quickly between different area. Having a night and day version of Kirkwall is cool; that's a case where I really don't mind a re-use of the map, since there is a different atmosphere to it, and different gameplay implications as well (not just quest differences, but more criminals roaming the streets and attacking at night). Also, a lot of the bigger quest maps have quick exits near the end, which reduces the amount of backtracking you need to do. (In Origins, there would sometimes be story-based ways to quickly exit at the end of a quest, but if you revisited later you would have to take the long way back. Now, there's often a second exit near the end that gets you out in a hurry... actually, now that I think about it, it's a lot like the improved dungeon design in Skyrim.) Oh, and I also like how the Kirkwall map lets you immediately move to some important interior areas, like the Chantry or the house for each companion. One slight improvement would be if you could choose your entrance into the major Kirkwall districts: you can already kind of do this if you go to one location and then immediately select the district, but it would be nice to be able to, say, enter Hightown from the south or Darktown from the east. Map markers work pretty nicely as well. At the big overworld map, only major quest markers are shown, for stories where you've already learned about where you need to go. Once you actually visit the area, though, you can see markers for new quest givers, as well as for quests that you've started but that don't yet have clear guidance. I think this sets a nice balance, where it's almost impossible to miss a quest, but you also don't feel like the game is leading you by the nose. Attributes are handled similarly to Origins: same six stats, and similar derived values. However, they seem to have been tweaked to encourage tighter clustering. For example, in Origins Dexterity affected your ability to dodge, and because of that, I would often give a tank nearly as much DEX as STR. Now, in DA2, DEX is really only important for rogues - it technically improves the odds of landing a critical hit for all classes, but to such a minor degree that warriors should never invest any points. Similarly, in Origins a Rogue might want a decent amount of STR if they wished to equip medium armor; in DA2, all rogue armor only requires DEX and CUN. As best as I can tell, rogues just need DEX and CUN with a small amount of WIL and optionally some CON (depending on how glassy you want your cannon to be). And actually, since a major reason for CUN is to deal with traps and locks, and my main is a rogue with lots of CUN, I'm giving pure DEX to my companion rogues. Warriors will want STR and a little WIL, plus some CON if they'll be tanks. And mages... well, I might get into this more later, but mages can dump almost everything into MAG, with some more into WIL or CON depending on how you build them. So, on the whole, attributes have been kind of streamlined, in a way that makes them a bit less interesting but not totally mechanical. I think most people will decide pretty early on what role they want a companion to play, and then will just dole out points based on that. Abilities have gotten a more significant overhaul. In Origins, there were many groupings of abilities which each had 4 tiers. You had to take the prior tier before the following one: for example, you could learn Flame Blast, which would unlock Flaming Weapons, which would unlock Fireball, which would unlock Inferno. Later spells were more powerful, but also had higher requirements (increased mana cost, and also often a minimum Magic stat requirement), so you could choose between a well-rounded mage who could react to many different situations, or a specialized mage who knew a few very powerful spells. DA2 shakes this up significantly: abilities are now contained within trees instead of simple rows. Learning a single ability might unlock two or three others; or, a later ability might require having learned multiple pre-requisite abilities. It reminds me a little bit of the Sphere Grid from Final Fantasy X, though more linear... there are still discrete schools, and some overall progression from early to later abilities. Also, certain abilities are now upgrades to existing ones. For example, you might learn Fireball first, and then later learn Searing Fireball, which increases the damage radius and the force of the blast. So far I've been taking advantage of these, since they give you a lot more utility for the same mana/stamina cost; however, since cooldowns are so long in DA2, I think there might be a good argument for grabbing many activated abilities. In theory, I like the ability trees of DA2 more than the lists in DA:O. In practice, though, some are designed extremely poorly. The thing that bugs me most is when taking an ability requires having a certain number of other abilities from the tree. In practice, this means that the game is forcing you to take an ability that you don't want in order to get one that you do want. It has irritated me enough that I've neglected some abilities that I probably should get, just because I didn't want to play their twisted little game. Skills are now gone altogether, and for the most part I think that's a good move. I'd earlier complained about how I never got any crafting done in DA:O because you always have better things to spend skill points on. Now, crafting requires three things: acquiring recipes (which can be bought, found, or rewarded); acquiring reagents (which are no longer inventory items! you now discover resources in the world, whereupon they will be permanently added to your capabilities); and spending coin. I have to admit that I haven't actually crafted anything yet, though. I've found plenty of potions while questing and don't need more. I like the idea of getting runes, but in DA2 they're no longer transferable, and I hate the idea of spending money on something that'll get replaced. I may finally buy some when I near the end of the game. I haven't bought any poisons yet, but I would like to try them out. Other skills: Combat Training is gone, which is fine; it's roughly equivalent to a few extra attribute points anyways, and otherwise it was just a pre-requisite for abilities, which can be handled just as well with a level requirement. Combat Tactics are now automatically awarded on level-up, and there are a LOT of them - I used to sometimes wish I had a few extra rows in Origins, and don't think I'll ever need half of what I have in DA2. Trap detection, trap disarming, and lockpicking are now all determined by the rogue's CUN score. Pickpocketing is gone entirely. From a roleplaying and lore perspective, that bums me out, but from a gaming perspective, I like it: I wasted a lot of time in DA:O pickpocketing every single NPC in the entire game with my rogue, which was a special kind of tedium but tedium nonetheless. Finally, there's no Persuasion skill any more. There also aren't any [Persuade] or [Intimidate] checks in dialog. In general, I like how they handle dialog now... instead of having choices being driven by skills, they're often driven by previous actions your character has taken. For example, if you learn a piece of information while questioning one character, it might open up a new choice on another NPC; or, if you've previously shown kindness to a person, you might get a new dialog choice related to your past history when trying to convince them to do something. This seems like a good way of doing roleplaying, based on your actual actions instead of which skills you've taken. Behind the scenes, one game change that has had a surprisingly big impact in how I play the game is the allotment of experience. In many RPGs, experience is divided among members of the party, either equally or based upon the contribution of the party member. In DA:O, only people actively in your party would gain experience, but people outside your party would be automatically leveled-up such that they were never more than 2 levels behind your main character. (So, for example, if you recruited Zevran at level 10, and never used him until you reached level 20, then he would be auto-leveled to 18.) Because of this, you could swap in a character for a particular quest if you wanted to without too big a penalty, but to get the most effectiveness from your party, it was best to recruit your core party as soon as possible, and try to keep the same people in your party at all times. DA2 makes an apparently simple change: everyone gains the same amount of experience, regardless of whether they are in your party or not. What I'm finding is that this suddenly makes me very eager to rapidly rotate through party configurations. After all, that way I'll get to experience all of the different party banters and hear their comments on everything. When I think I'm heading towards a major confrontation or a particularly long quest, I have a core party that I fall back on; but for most outings, even if there will be combat involved, I feel like I can just grab any three random people and be okay. Thanks to the weird, easy-yet-annoying combat system, I don't get a lot out of combat planning or strategy anyways, so I can have, say, three rogues or three mages in my party and still breeze through fights. This flexibility also lets me try and match quests to companions. I'm gradually starting to get a good understanding of what makes each companion tick, and so I'll know if, say, a quest will involve me helping a mage, there are certain people I should bring and others who I should probably leave at home. That being said, I do wish that it was a bit easier to change party configurations... there are already a good number of banners scattered around that let you re-form, but I do kind of miss being able to swap out your party at any time in a city area like I could in DA:O. So far I've experienced two time gaps in the game: a year between the prologue and Act 1, and then three years between Act 1 and Act 2. I do enjoy the storytelling possibilities this opens up. The game can do a lot of stuff very efficiently through exposition that would be expensive or time-consuming to do through narration, and I like hearing about what Hawke and her companions were up to during the time they were "off screen." I decided to play around with this a bit more, and visited the Black Emporium once Act 2 started, where you can adjust your character's appearance. I changed her hair color, gave her a slightly darker tan, and added some more tattoos. I like how this gives the impression that she's actually living through this story, growing older and changing slightly through the years. Okay, let's talk about story now! I've been able to stay on the Friendship path with most of my companions so far. I maxed out Bethany pretty early on, but given her smaller ability pools, I already had a hunch that she wouldn't be sticking around as long as the others. I haven't maxed out anyone else, but I've raised Merrill, Isabela, and Varric high enough to unlock their personal Friendship passive. Aveline probably just needs to get a little higher; I started off in Rivalry with her after the prologue, mostly due to my standing up for Bethany and taking care of her husband, but by carefully picking the quests I took her on I have brought her pretty high in the Friendship spectrum. I got Friendship points with Anders off the bat, but he almost immediately raised the prospect of romance, and when I turned him down I took a massive Rival hit. It's been stubbornly difficult to bring him back up; even though I'm generally pro-Mage, he finds all sorts of things to get irritated by. I'm finally back in the Friendship zone with him, but unless something major happens soon, I doubt I will ever max him. I've pretty much given up on Friendship with Fenris. Again, since I'm pro-Mage, he disagrees with most of my decisions. It feels like it has enough momentum to now be hard to reverse: even when I gave him a gift and said nice things, he reacted with Rivalry. But, it's not all bad... his Rivalry bonus is at least as good as his Friendship bonus, so this feels like a good solution to give you different ways to roleplay your relationships with followers and still play effectively. He does have an interesting story, though. I'm sure that there's more to come from his quest, and more revelations about who he is, what was involved in his tattooing, his master, etc. ; but as it stands now, he's already providing my first glimpse into the Tevinter Imperium and the noxious combination it creates between slavery, political power, amoral research, and endless war. The thing that frustrates me is that Fenris understands more than anyone else how evil slavery is, and yet his own prejudices against mages make him a stern advocate for a de-facto enslavement of mages. I sometimes wish I could shake him and make him realize that freedom is a universal need, not something to be shifted from one group to another. I'm currently flirting with both Merrill and Isabela. I imagine that the game will eventually make me choose (at least, every other Bioware RPG so far has), and I will probably pick Merrill. Isabela's a lot of fun, though, and I've really enjoyed the cut-scenes in Act 2 that show the two of them interacting in the Hanged Man. Merrill is so curious about the world and how it works, and Isabela has so many stories to tell about the world and how it works. Merrill's been a pretty surprising character, though. My initial reaction upon meeting her was basically, "Awww, what a cute elf!" Then, during the first quest when she uses blood magic to open a barrier, my reaction was, "Awww, that cute elf knows blood magic!" Like it was, you know, a character quirk or something. As I've gotten to know her better, though, it's become an increasingly interesting combination: she seems so cheerful and open-hearted, and yet, as she will cheerfully inform me, she sees absolutely no problem with making a deal with a demon if it proves advantageous for her. Possibly my favorite part of the game so far has been when I visited the Fade to try and rescue a Dreamer. I brought along Merrill, Isabela, and Varric. (Anders sounded worried about entering the Fade, or else I would have brought him instead of Isabela.) This is a much smaller glimpse of the Fade than we got back in Origins, but it's still pretty awesome: weird books that fly around, ethereal architecture, discursive demons. Anyways, Isabela was tempted by a Desire Demon who promised her her own ship to captain if she would fight against me. (Which led to the amazing, groan-worthy line, "I like big boats, and I cannot lie.") Later, Merrill was tempted by a Pride Demon who offered her power. In both cases, I learned that I could significantly boost Friendship by picking the "joking" response (basically, "Yup, that totally makes sense, you should absolutely betray me"), killing them, and then accepting their apologies after the fact. Running through the other companions: Isabela is still kind of an enigma, though I'm guessing I might learn more about her relic soon. I like Varric much more now than I did in the beginning... I still wish he would put on a shirt, but he's very funny and knowledgeable, and he also does a great job when I need him to tell a lie for me. I like Anders a lot more in this game than I did in Awakening... he's more serious, and doesn't joke as much, but I think that focus and sense of purpose gives him some much-needed gravitas. Plus, it's totally fascinating to think of Justice co-inhabiting him, and it makes some of the odd epilogues of Awakening make a lot of sense. Finally, I really enjoy the sardonic rapport that Hawke and Aveline share. Aveline is totally honorable and honest, and knows that Hawke does a lot of illegal stuff, but chooses to focus on the worthwhile things Hawke does. I feel like Aveline hopes that she can redeem Hawke and make her live a better, more virtuous life. The new mansion is nice. That's another positive aspect of the time shifts in the game: it can give you a significant sense of social progress within the game. Now, in the middle of DA2, I feel a little like I did while playing Awakening: like I was already a fairly well-known and respected personage, who had made an impact on the community and was exerting some large-scale influence on the overall society. I think this is a terrific way to design a game, and, incidentally, it also avoids embarrassing artifacts like people in Skyrim saying things like, "Do you get to the Cloud District? What am I saying? Of course you don't!" long after you've become renowned throughout the land as a mighty dragon-slayer. I enjoyed the expedition at the end of Act 1. It was some truly new territory to explore, plus it had a very challenging fight at the end, which was the only time so far in the game where I've actually had to reload. (I'm pretty sure that I'm missing some strategy element to this fight - I was never able to find a way to avoid taking massive electricity damage during the phase where the rock wraith turns invulnerable.) Bartrand's betrayal was surprising; I had a feeling that he was rough and unscrupulous, but was not expecting him to actually turn against me. It seems pretty clear that the idol is going to be more important, but I'm not sure if it actually possessed him, or if he knew about it ahead of time, or what. I'm also very curious to learn just what the deal with that "thaig" is. I get the hunch that we may be learning some pretty deep lore about the dwarves... maybe something about what they were up to before the Darkspawn arrived, or about a long-lost branch of them, or, uh, I dunno, maybe mage dwarves or something goofy like that. As noted above, I've mostly been hewing to the mage side in the controversy, but it's a tough choice! Within the world of Dragon Age, mages really are dangerous. There's a reason why the Circle exists, and the damage an unprepared or unworthy mage can do seems comparable to the restrictions placed on their freedom. I can't think of any satisfying real-world analogy to their situation... perhaps a virulently infected person, if their disease also gave them superhuman powers that could benefit mankind when their disease was kept in check. I've been quite happy with the little ways in which the game has honored the choices I made in Origins. Little details go a long way: when I hear someone refer to Queen Anora, I puff up a little bit in pride: "That's right! I MADE her Queen!" It has recognized a bunch of stuff that Kiriyon accomplished: putting Prince Bhelan on the throne of Orzammar, freeing Ferelden's Circle of Magi from the Templars, transforming the werewolves back into humans. I've even been mostly-okay with the way the game ret-conned Flemmeth back into the story: I think it's a stroke of genius for the developers to make you actually act out the retconning yourself in-game, rather than just handing it to you in a slice of exposition. Plus, they foreshadowed it rather nicely in Witch Hunt. (I have heard some people who were less happy when the game denied certain major decisions they made in Origins, but so far I've been lucky in that regard.) One thing that has been interesting has been trying to tease out the differences between Kiriyon and Selene... for example, when I first encountered the surviving Harrowmont by the Kirkwall docks, I needed to reconcile Kiriyon's support for the Bhelan ascendancy with Selene's own moral compass. Selene has never visited the Dwarven cities, and hasn't seen the impact of the old caste-system first-hand, and so she wouldn't weigh Bhelan's value as a reformer as highly as Kiriyon did. Based on the evidence in front of her, she would naturally side with Harrowmont... and so she did, and thus in a small way helped undo a little piece of Kiriyon's accomplishment. Similarly, Kiriyon, as a mage, was automatically in favor of increased autonomy for the Circle. Selene's own perspective, as a non-mage who belongs to a family with magical talent, is more nuanced. From an immediate role-playing perspective, Selene is profoundly protective of Bethany. If her sister weren't a factor, Selene would probably be more cautious, and perhaps steer a middle path through the controversy or seek the greatest profit. As it stands, Bethany opened Selene's eyes to the suffering of mages, and because of that grows even more sympathetic of people like Merrill and Anders who live their lives in fear of capture. Selene is driven by several factors, which can pull her in contradictory directions. She is loyal to her mother and sister (though not all family - she had a deep well of patience for Gamlen that he swiftly ran dry). She also loves her friends, and will support them even if it means causing trouble for other people or suspending her own ambitions. In Ferelden, she was well on her way to becoming an accomplished thief. Since the upheaval of the blight and their flight to the Free Marches, though, she has mainly abandoned her aspirations of larceny and now dreams of building a fortune and becoming a player in the city's politics. She doesn't want money and power for their own sake, but sees herself as potentially becoming an actor for greater good in the world. She is perhaps willing to occasionally use some less-than-reputable levers in order to achieve those good ends. Old habits die hard. She has a particular soft spot for the oppressed: Ferelden refugees, elves (both Dalish and city), and mages. She doesn't oppose the rich or the powerful, though; rather, she hopes to join their ranks, and reform their institutions. On a D&D scale, I'd say that she's vaguely Chaotic Good. I'm still cranking along, having a pretty good time. I think that if I'd plunged into this game right after playing Origins for the first time, I'd be disappointed by the smaller scale of the world. But, since I'm playing it after hearing for years how bad it is, I've been pleasantly surprised so far. Other than the combat and the recycled environments, I think that the game actually improves on Origins in a lot of ways, streamlining the interface and systems such that you can focus more on the story and less on clicking through menus. There's still plenty of time for them to screw it up, but thus far, I'd say I've more than gotten my seven bucks' worth. This feels like a confessional statement to write, but here goes: I've started a game of Dragon Age 2. If you follow this blog... well, first of all, I apologize for wasting so much of your time. Secondly, you may recall my loving-yet-fraught relationship with Dragon Age. The original Dragon Age: Origins has solidified its position as one of my all-time favorite games: it is a vast, sprawling game, filled with fun stuff to do, which also has the best morality system I've yet encountered in any game and arguably the best, most complex characters to ever be depicted in a video game. This is also a game that has broken my heart and filled me with rage, thanks to technical failures and barely-concealed greed. The passing of years has dimmed the pain of its betrayals, and elevated my appreciation for its qualities, to the point where I want to continue exploring the world it has opened. Which brings me to the subject of Dragon Age 2. Like some other games of its era (see also Civilization V), it was released to the immense acclaim of the professional gaming press, and an almost universal revulsion among the franchise's fans. The backlash was so profound and negative that, coupled with my lingering animosity over the whole DLC situation, I simply dismissed it out of hand. Fast forward to 2013: I've now completed a second run through the original Origins, and also experienced all the Origins DLC for the first time. I've also had a wonderful experience with the Mass Effect series, which had a great deal of influence on the design of Dragon Age 2. Dragon Age 2 can be purchased for $7 from Amazon (cheaper than the original game, which came out two years prior). Dragon Age 3 looms on the horizon, and while details remain scarce, it sounds as though Bioware has listened to its fans and are making an effort to please them. So, I decided that it would only be polite to at least see for myself what is happening in Dragon Age 2. As of this writing, I am still early in the game, partway into Act 1. Since this is my first time playing the game, I thought I'd share my reactions as they occur to me. Also, I won't be doing the screenshot thing that I've done in my recent Origins and Mass Effect games, just because I find that it takes me out of the game a little while I'm playing it. Let's start with the negatives. 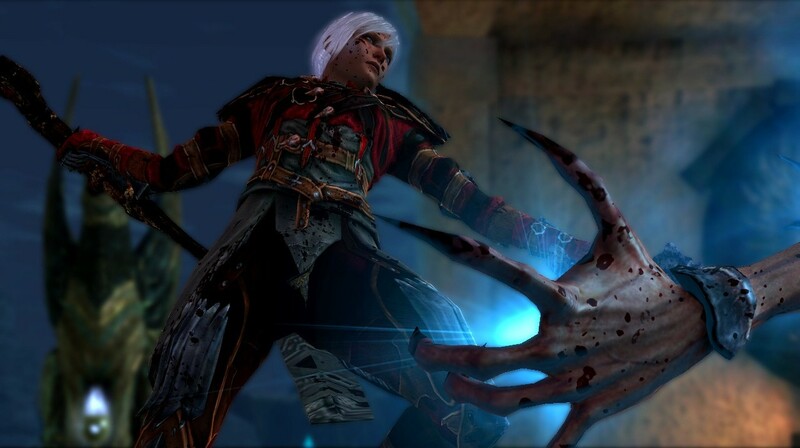 What does Dragon Age 2 do wrong, or worse than Origins? The most annoying thing so far has been combat. The designers clearly intended to make combat faster-paced and quicker in DA2 compared to Origins: some big fights in Origins could take more than five minutes to complete, depending on your party composition and how closely you controlled your characters. DA2 combat runs more quickly, and it feels like it runs incredibly fast. However, it does this in large part by instantly spawning enemies directly next to your characters. This makes it impossible to control the battlefield, removes any sense of realism (in DA:O, "spawned" enemies usually had to run in from offscreen), and removes much of the strategy from the game. It feels like DA2 is caught in an awkward space between a tactical game like Baldur's Gate or Origins and a hack-and-slash game like Dark Alliance. It still has many of the trappings of a tactical game: you can pause at any time, switch between characters, give orders, position people, etc. However, the flow of combat makes it difficult or impossible to approach battles tactically. You can try to defend your mage, but a smuggler can still materialize next to them and attack. On the topic of realism: watching combat in DA2 is very exciting. It moves very fast, with characters constantly attacking and showing off great animations. However, I often feel like I'm watching Devil May Cry rather than Dragon Age. My main character is a rogue, and has this awesome-looking but absurd move where they pull out two daggers, leap in the air, fly forward thirty feet, then crash down onto their hapless enemy, stabbing them in the head. It looks like something out of a superhero movie, and doesn't have the same tone of grim, dark, realistic fantasy that I loved so much in Origins. Combat hasn't exactly been hard, though... I'm playing on Normal, and have yet to have any character fall to an injury. I think it will take a while for me to get used to the rebalanced skills and pace of battle. In particular, I've been surprised to see that Heal is such a rarer spell in this game; one of my mages doesn't even have the option to learn it, and for my mage who does know it, the cooldown is very long. On the flip side, though, a single casting of Heal or ingesting a single poultice seems to instantly restore all of a character's health, regardless of how low it is. That may change as they level up, but for now, it's extremely effective. One of the complaints I'd read about the game was the design of its interface and menus. In contrast with the natural look of many fantasy games (which use textures that may look like stone, wood, or bone), DA2's menus look almost futuristic, with a kind of chrome appearance. I actually am fine with the look of the menus: it's unusual, but the alienness kind of works for me, and emphasizes the strangeness of the situation that the characters are in. However, I HATE the sound of the menus. There's a futuristic clicking sound as you hover over each selectable entry, and whenever I dismiss the codex (which happens a LOT), there's a faint computerized sound. It's very annoying. The fetch quests are rather poor. These are the quests where you, say, need to pick up a Widget of MacGuffin and return it to Lord Timewaster. In DA:O, these were generally handled through the job boards. In DA2, it seems like most of these get their NPCs, but I don't know why they bother, since they just recycle generic dialog and don't bother with any cut-scenes. It feels weird to be returning, say, a "Dismembered Hand" and have the other person say, "Oh, thank you! I didn't think I'd ever see this again!" I think that's it for complaints so far. On to the neutral: there are several criticisms I've read about the game that personally don't bother me. 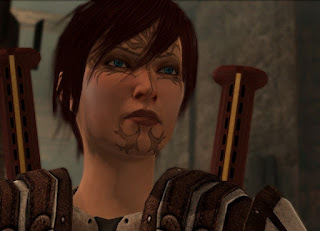 One major issue is the customization of Hawke, the player character. Hawke is very clearly inspired by Shepard in Mass Effect: you can customize his or her appearance, and control their personality, but many elements of their background are fixed. Shepard is always a member of the Alliance military, and Hawke is always a human refugee from Ferelden. Up until now, all of Bioware's fantasy RPGs have given you a large degree of latitude in creating your character, and all of them have allowed you to select your race. This can allow for a large degree of customization, makes characters look very different, encourages replay, and can lead to more roleplay possibilities. Creating a fantasy RPG where you must play as a human feels like a step back. That said, I personally do not object to this (though I imagine it may keep me from ever replaying the game). Fans often point to the great variety of origin stories in Origins, where the game was able to give unique backgrounds to your character while still leading them into the same main plot. As I see it, though, this was a necessary tradeoff: Hawke is fully-voiced, and family members carry forward throughout the plot (unlike in Origins, where they would typically just pop up in periodic scenes). From an immediate, selfish perspective, I played Origins once with a dwarf and once with an elf, so I probably would have chosen a human for DA2 anyways simply for variety's sake. I also read several complaints about customizing your human Hawke: you can pick between the default Hawke appearance, which looks great but can't be customized, or you can make your own Hawke, which can look like anything you want so long as you're fine with looking ugly. I was able to address this somewhat thanks to the Chargen Revamp mod, which lets you tweak the Hawke appearance: you can keep the great hair and facial structure, for example, and play around with hair color, eye color, etc. After spending over fifteen minutes fiddling with it (what, me obsessive?) 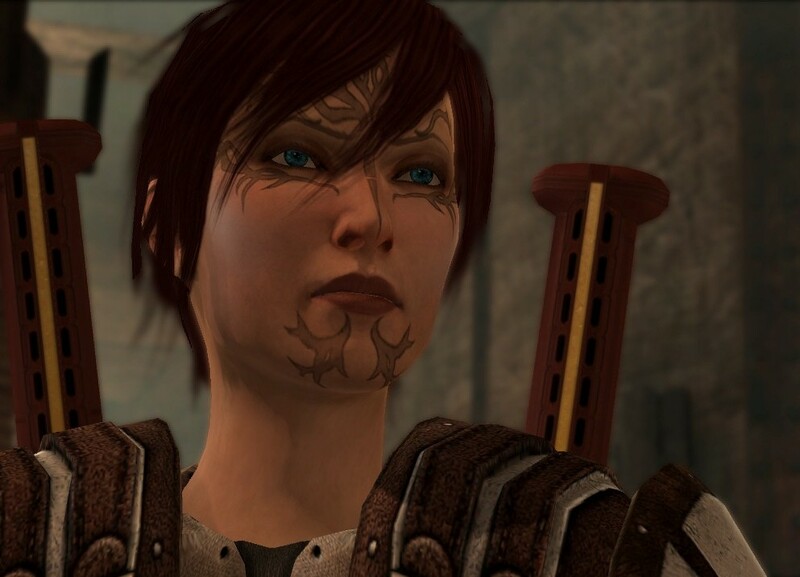 I ended up with... someone almost exactly like the default Hawke, just with a new tattoo. But I had carefully considered every option, and so felt like I at least had some ownership. The whole concept of Hawke is still controversial. You can give them a first name, but nobody will ever use it, of course. There's less of a sense that you are creating a character of your own, and more of a sense that you are acting the part of a character that someone else has created. The flip side: it's a more interesting, complex character than I probably could have come up with. This ties in directly with conversation in the game: unlike Origins, where your character was silent (and thus you could imagine for yourself how he or she sounded), in DA2 Hawke is fully voiced, and is more of an active participant in discussions. In Origins, your Warden mostly asked questions and gave orders; in DA2, you can still do those things, but can also commiserate, engage in repartee, plant insinuations, etc. I'll need to wait until I'm later in the game to decide which system I prefer. I absolutely loved conversation in the Mass Effect series, which I think was due in large part to the wonderful performances from Jennifer Hale and the rest of that fantastic cast. The voices in DA2 are good, but so far have been less impressive. You gain more resonance and color from a voice acted PC, at the cost of the identification you can make with a voiceless (or, as I think of it, self-voiced) PC. That said, I imagine that voice acting is here to stay for the franchise. Customization is actually a pretty hot topic in DA2, and is one of the things that Bioware has explicitly said it's looking at for DA3. In Origins, you equipped your NPCs similarly to how you equipped your main character: you could assign them some assortment of helmet, breastplate, gauntlets, and boots, either to focus on certain statistics or to give them a particular look. Sometimes you can find matching pieces of equipment that form a "set", which gives the character a more unified look and also provide additional bonuses. In DA2, your main character can still be equipped this way, but all your companions wear special "companion armor". This gives them a single appearance; the armor automatically upgrades as the game progresses, but you'll never find a cool helmet in a dungeon that you can give to your warrior, for example. The overall system is very similar to Mass Effect, where you can make fairly fine-grained decisions about how to equip Shepard but have less control over your companions. I'm not sure yet how I feel about this change. There are some nice benefits to it. For starters, I spend less time sorting through my inventory, deciding what to do with equipment. If I get any armor that requires Strength or Magic, I can just sell it. In Origins, I would often hold on to more armor than I needed, just because I thought that one of my companions back in camp might have a use for it. You can still customize your companions' stats somewhat, since the game lets you equip them with necklaces and rings, which can have significant bonuses. As for appearance, as Bioware has pointed out, restricting companion armor has allowed them to actually create unique bodies for each companion. This would be prohibitively expensive if they had to account for every permutation of companion and armor. (As an example, in Origins, Morrigan was the only companion with her own body model, and if you ever put her in any armor other than her "special" armor, she would revert to the default female model.) While I don't much care for Varric's body model, I do like the way most other companions look. I currently have three females on my party, and they're all visually quite distinct. Also, while I really enjoyed customizing the look of my companions in Origins, it can be very difficult to make someone look good piecemeal: what to do if they already have a matching set, and you find a much more powerful and uglier breastplate? So, on the whole, it's been a bit of a mixed bag. It's a simpler system, and has helped lead to great-looking companions, but is also yet another thing that decreases variability and diminishes the odds that I would ever replay this game. Possibly the single most controversial element of DA2 is the dialogue wheel. This is the element that was most obviously taken from Mass Effect, is one of the first things you will see when starting a new game (even before creating your character! ), and drives almost every interesting scene in the game. Origins, like all other Bioware fantasy RPGs before it, presented you with a numbered list of choices to make in any conversation. These would combine questions, statements, demands, whatever was appropriate. A short dialog or one taken under duress might only have one or two options; some expansive ones could have a dozen or more. This gives a great deal of breadth in planning and conducting conversations. In contrast, the dialogue wheel that Mass Effect introduced is constrained by its interface, such that you can never see more than six conversation choices at any time. In certain cases, by placing some choices into a secondary interrogation wheel, you can have a total of up to ten speaking choices, but that's pretty rare. And you will rarely get the full six options; again, for trivial conversations, you might just see one or two. Origins and other earlier games generally presented you with the specific words you wanted your character to say: "What have you heard about Arlathean? ", "Let us kick the butts of evil! ", and "Farewell, my dear friend" might all be valid options. With fully-voiced games like ME and DA2, the conversation wheel instead gives cues about what your character might say, and you'll hear the actual dialog after making your selection. The above lines might be represented in the wheel with "What about Arlathean? ", "Let's go!" and "Goodbye." Furthermore, there are general rules about the wheel that give you some clues as to the impact of your choices. In both ME and DA2, questions tend to be on the left of the wheel, while decisions are on the right. In ME, Paragon responses tend to be at the top of the wheel, and Renegade responses at the bottom. I actually really like DA2's use of symbols that materialize inside the wheel when you hover over a response; there's a surprising variety of them, and they indicate whether your option fits any of a variety of categories, including Diplomatic, Humorous, Helpful, Aggressive, Lie, Extort, and so on. I'm especially excited to see the arrival of clear symbols that inform you whether an option will initiate or terminate a romance; that's been one of the most frustrating aspects of Bioware romances going back to BG2, and I'll be delighted to no longer need to play the game of "How do I keep this romance from starting or ending?" Anyways. I don't totally buy the premise that the dialogue wheel intrinsically harms dialog. While it's true that the interface supports fewer options at any given point in the conversation tree, a technical capacity for more discussion does not guarantee, or even generally correlate with, a higher quality of dialog. I vividly remember the keyword-based dialog system of Ultima VI, where there wasn't even a menu to choose from: you directly typed in what you wanted your character to say. In theory, this could have led to nearly limitless combinations of interaction, deep nuance, and incredibly deep and varied conversation trees. In practice, though, it didn't much matter, because almost every conversation consisted of you typing "name," "job," and "bye" in sequence. In contrast, in Mass Effect I was only rarely frustrated by missing an option; the things I could say seemed well-thought-out and reflective of the character. The other point to make is that a dialog is, well, a conversation. I'm noticing that DA2 conversations with companions tend to be narrower but deeper. In other words, when I chatted with a follower at camp in Origins, I would often have a very long list of potential topics to explore with them. I would pick one, then follow it through the follow-up questions and responses, then pick another topic and repeat. In contrast, speaking with a companion in DA2 will generally auto-initiate conversation on a particular topic. You can explore it deeply, and then it's gone. I feel less like I'm ordering off a menu, and more like I'm, y'know, actually talking with someone. I'll definitely need to play longer before making a final decision; right now, I feel like the DA2 dialog system is different from Origins, but not necessarily worse. Having companions with their homes is another interesting departure from Origins. From a story-telling and roleplaying perspective, I like it better than the camp in Origins. It fits this story better: since we're all living in a city, and the main character isn't exactly in a palace, it makes sense that people would be living in their own place. I also like the sense of character you get from each follower's lodgings. In Origins, it felt very evocative to have Morrigan building a separate fire far away from the large flame in the middle of camp. In DA2, you can get little details like that for each of your followers. From a gameplay perspective, though, it's very annoying. Each companion is in their own zone, so you'll need to sit through a loading screen for every person you want to visit. (Fortunately, loading times are quite speedy in this game.) Worse, though, we've lost the great ability from Origins to view all party members' inventories at once, which was a terrific way to flip through everyone, shuffle around equipment, and decide how to put together your party. In DA2, as far as I can tell, you need to pick who to put in your party, then you can only manipulate their equipment, whereupon you will need to re-form your party, and give the old equipment to the new members. My party is very small at the moment so it isn't a big problem, but I can definitely see this becoming a headache when it grows bigger and, for example, I want to make sure all of my mages are using the staves that make the most sense for them. Last but not least, let's talk about what the game does well! For starters, it looks gorgeous. It's a bit hard to believe that it came out so soon after Origins, because it's a drastic step up in visual quality. The character models are much more detailed, the environments are lush, and as I've noted before combat is very pretty to watch (if maddening to play). I'd like to particularly call out the wonderful idle animations all of the characters have. I sometimes enjoy just taking my hands off the controls for a while, zooming around the camera, and checking them out. They'll work out kinks in their neck, examine a sore elbow, or knock the dust from their boots. It looks incredibly smooth and natural and makes the world feel very lived-in. Other players have complained about repeated environments, and I suspect I'll have the same complaint by the time the game is done, but at this point I'm mostly amazed at how well-designed they are. Kirkwall is orders of magnitude cooler than Denerim, which was a pretty cool city to begin with. Kirkwall feels much more three-dimensional, has a great variety of neighborhoods, and jaw-dropping backdrops. I also really like the sandy and mountainous outer environments I've seen so far. Like in Origins, they tend to be pretty linear, but they look great. DA2 has the good sense not to mess with some of the best stuff from DA:O, and should get credit for that. High on the list: intra-party banters. These are always my favorite part of Bioware RPGs, and the ones I've heard so far have been great. Relaxed, interesting, revelatory dialog that clues me in to what my companions are thinking and feeling, and adds to the feeling that they're independent people with their own ambitions and desires, not just pawns under my control. The quest journal is good. I like the categorization into types of quests - DA:O also had categories, these have less character but are clearer. (So you'll see "Secondary Quest" instead of "Mages Collective", for example.) The plot markers are handy as well. I'm relieved to see that the game does far better than ME3 in this regard. I'm too early in the game to know what the big plot is... and that's good! First of all, I'm pretty happy that I've made it this many years after DA2's release and haven't been totally spoiled on the outcome. Secondly, it's just neat that I don't already know where the game is going. For all that I love DA:O's plot, you learn very early on exactly what the game is going to be about, and spend much of the game getting there. It feels nice to be a bit in the dark as to what's going on. I'm also digging the framing device for the game. As an English lit major, I dearly love unreliable narrators. We've had them in video games before, but they aren't common. There's some fun stuff that you can do with it, and it also lends itself nicely to some meta-ideas like reloading saved games and replaying the game. The time gap in the game is pretty neat, and from what I hear, there will be others in the future. I like it when Hawke runs into someone and they reminisce about something they did together between the prologue and now. It's another thing that makes it feel less like I am Hawke, but also makes it feel more like Hawke is part of a living, breathing, growing, complex world, and gets up to all sorts of boring stuff that the game skips over. From what I read, the game gets rid of the straight/bi orientations of DA:O and the straight/bi/gay orientations of ME3 and lets anyone romance any romanceable character of either gender. I like that idea, though I haven't gotten far enough into the game to see how well it works in practice. Oh! I also like the idea of Friendship/Rivalry replacing Affection. I absolutely adored DA:O's morality system, but I also felt like the game was implying there was a right/better way to play the game. You could roleplay any way you wanted to, but by making certain decisions, you could maximize your followers' affection. More affection was always better, so there was a mechanical (as opposed to story-based) reason to make everyone love you. I like the idea that I can deepen my relationship with a companion in a negative way, and still get a benefit from that. It's a bit like if there were separate Paragon/Renegade meters for each individual companion. Again, it's too early in the game for me to tell how well it succeeds, but already it's brought up some intriguing situations. My decisions early in the prologue set me a little ways along the path to Rivalry with a character I like a lot, who I will probably try and keep in my party. So now, I need to decide whether to continue pushing towards that Rivalry in order to unlock the associated perks, or to take the longer and harder path and reverse course towards Friendship. For the most part, I love the way that companions look. Merrill is my favorite so far, and I have a feeling she'll be my romance interest (although I know there's at least one more female companion I haven't met). Like I noted above, each companion gets their own body in this game, and Merrill's is great: she's an elf, so she's diminutive and delicate. Her idle animation is fantastic, and reflects the wide-eyed wonder she feels towards the world of humans, along with her nervous skittishness. Her eyes are great, too, and feature the largest irises I've ever seen outside of anime. Her voice is incredible, too, as is her adorable way of growing tongue-tied and frantically digging herself out of conversational holes. Varric is my least-favorite-looking companion thus far. I would like him 100% more if he would just put on a shirt, though. Bethany is pretty fun. I'd vaguely remembered reading before about how Varric, the unreliable narrator, makes her far more buxom in his embellished version of the tale than she appears in "reality." That said... it isn't that much of an embellishment. I'm delighted to have Aveline in my party. For starters, this is the first time in any DA game that I've been able to have a female warrior as a permanent companion, which means I can finally run an all-girls party if I want. Second, I just really like her personality: there are some echoes of Jaheira in how her story starts, but the game is really getting into some of her great qualities, like independence, loyalty, honor, stubbornness, and career orientation. I was pretty surprised to see a romance heart pop up after I completed her first personal quest, since I hadn't thought that the game would let me romance her. I didn't pursue it, since I don't think she would get along too well with my rogue, but I think that relationship could work great with the right character. For the first part of the game, I was mostly "stuck" with my initial companions. I've now acquired Merrill, and think I'll probably be getting Fenris and Anders soon. I like Anders a lot more now than I did in Awakening (at least, based on the little I've seen of / heard from him so far). Fenris looks cool, though I've only briefly met him so far. Anyways: I'm currently running a group with Hawke, Aveline, Bethany, and Merrill. Two mages seems a bit redundant, since they appear to be less powerful in DA2 than they were in DA:O. I'll probably swap out Bethany for another warrior or rogue at some point to increase my DPS. That's it for analysis! I imagine that future posts will be more concerned with plot, but I'll certainly mention if I suddenly start loving combat or hating dialog or something. I'm playing as a female rogue named Selene Hawke. I still really don't know what I'm doing as far as putting together a build; I'm dumping most points into CUN and DEX, with a slight preference for CUN, and have invested a couple into WIL. I just reached Level 7, and took Shadow as my Specialization. I dual-wield daggers. I typically open a fight by knocking a Miasmic Flask towards the largest group of enemies, and then focus on bringing down weak ranged units. I use Stealth whenever I draw too much aggro, then re-attack once I'm free again. So I think I'm going to mostly be a backstabbing, stealthy rogue, but we'll see how I end up. I'm currently running with a tank and two mages. Only one mage has Heal, which is weird. I'll probably try and introduce a two-handed warrior at some point; I haven't regularly used one of those since my initial play-through of Origins back in 2009. At the moment I'm following my standard operating procedure for RPGs and doing every side-quest and getting every companion I can before continuing with the main quest. It looks like I still have a fair ways to go. And, frankly, that's kind of what concerns me. Thus far, my DA2 experience has been very positive. It remains to be seen how well it will continue to wear over the long run. Based on the reviews I've read, there's a fair chance that it will come to feel repetitive and annoying before the end. I wonder if this might end up being a problem somewhat like what Coca-Cola got itself into back in the 1980s. As Malcolm Gladwell recounted in his interesting book Blink, Pepsi was famous for issuing the Pepsi Challenge, where they would present consumers with Pepsi and Coke in small, unmarked cups. The consumer would sip each, and declare which one they preferred. They almost always picked the one with Pepsi. Coca-Cola initially assumed that this was because the tests were biased; however, when they ran their own secret versions of the test, they were shocked to come to the same result. So they created New Coke, a new formulation that reliably beat Pepsi in these blind-taste-tests. And... as we all know, it was a disaster. As Gladwell points out, the problem is that they were solving the wrong problem. In the real world, we don't take a few sips of a soft drink: we buy a can and drink the whole thing. Pepsi's sweeter taste may seem better than Coke's with just a couple of sips; over a whole 8 ounces, the even sweeter taste of New Coke was unpalatable. That's what worries me a bit about DA2. Moment to moment, the game looks gorgeous and exciting, full of kinetic action, stunning environments, and glamorous characters. I can see how, if a professional reviewer sat down with it for an hour, they might walk away fully impressed at all the ways it has improved over the original Origins. That isn't the way RPG fans play games, though: we dig in, we explore, we locate every nook and cranny, we run every optional side-quest (even if it isn't fun!) and every bonus dungeon. In games like Origins and BG2, we could do that and have fun... then do it again, and again, and again, and keep doing it more than 15 years after the game first came out, still reveling in the variety of the game. Will DA2 continue in that tradition? I feel like the mass of gamers has said "No." I hope I'll be able to say "Yes." I'll let you know what I find out!